Axact v3.1 is a modern, clean, responsive and flat Blogger template suitable for magazine, news, sports, tech, games and multipurpose blog. Axact is designed with flexible approach lets you to easily change the color, font size and other customization that you can made through blogger template designer. The main features of this Blogger theme is SEO Friendly, Fast loading, Ajax search result, 5+ unique homepages, pro shortcodes and many more. 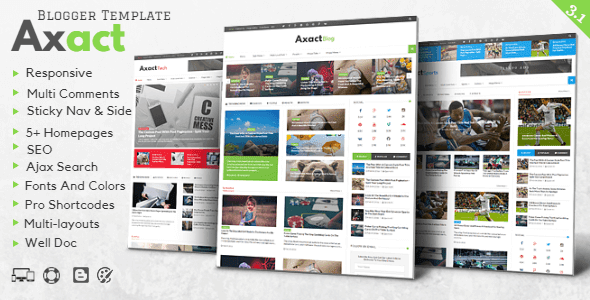 You can also Download previous version of this theme Axact v3.0 – Responsive Magazine Blogger Theme. for more information about this Blogger Theme please click on Demo Button.